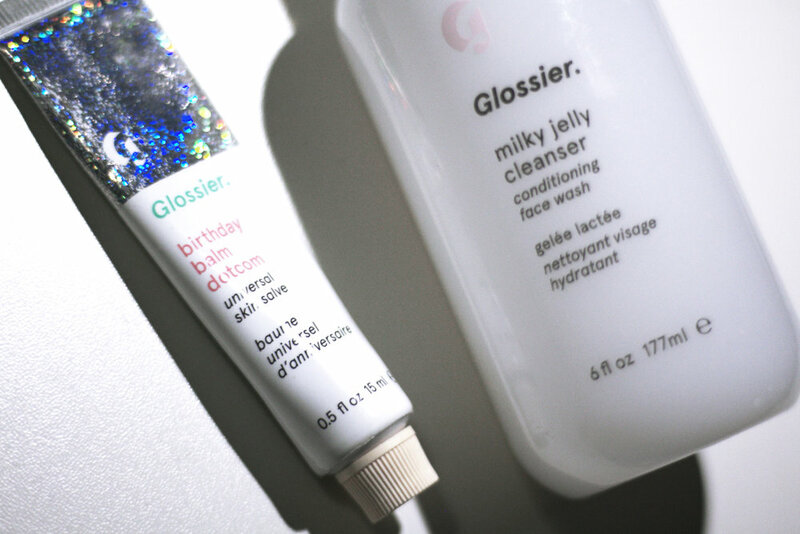 I've been using the Glossier Milky Jelly Cleanser and Balm Dotcom for a few months now. 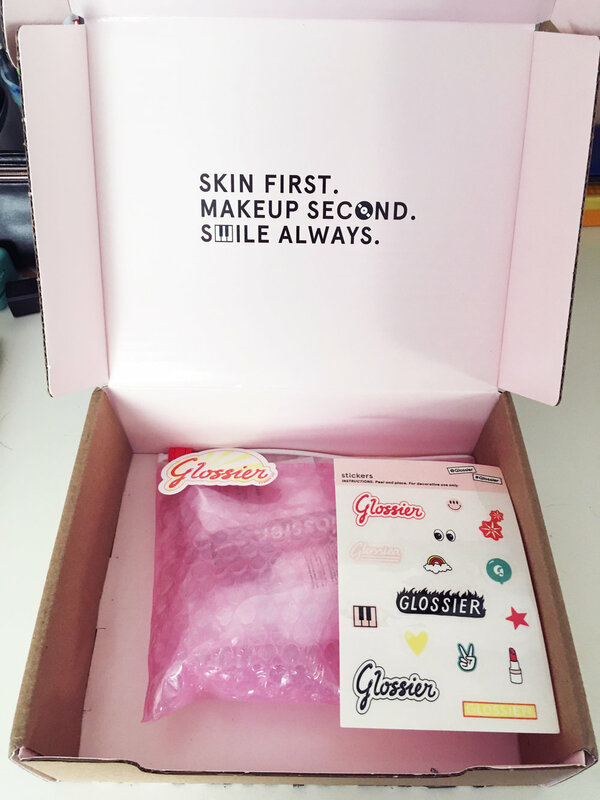 Actually, I purchased this around the same time I reviewed the Glossier Cloud Paint. Now that I've been using these two products for over 6 months now, I can say I have formed a thorough opinion on these products. FYI - I have dry skin in the winter with oiliness in the T-zone in the summer. Back packaging label. Click for larger image. It's gentle. But it doesn't wash off makeup completely. They advertise that it's gentle enough so that you can open your eyes while using this and I can attest to that. It has a light floral scent, probably from the rosewater which is an ingredient. Jelly-like, as the name alludes to. It does not form suds, and I like this unique consistency. The packaging is simple and minimalist. You can pump once for enough product for the entire face and then lock it by twisting to the side once you are done. I use this cleanser in rotation with a couple other cleansers. I particularly tend to reach for this one when I don't have make up on because I like the gentleness but it does NOT completely remove makeup. When I tried to wash off makeup, I would end up with panda eyes as this does not take off all mascara and eyeliner. I do continue to use it as I do love how my skin does not dry up and flake. After rinsing, my skin feels supple and not tight. Overall, I really like it. I'd recommend if you are looking for a gentle everyday cleanser but I would take off makeup with something else beforehand. I'd recommend to use this in the morning or anytime when you don't have make up on. The gentleness is a real seller for me, and I might repurchase again. I'm a fan of this balm. I actually repurchased this one. When I visited Glossier's showroom in New York City, I got a chance to whiff the flavors (it's free and open to the public btw). I ended up getting Birthday and Cherry. Birthday - This birthday-cake-scented balm goes on clear and has glitter for a subtle sparkle. Quite yummy. I like this scent. I prefer this over the cherry scent. The glitter is barely visible, so I don't really see why it's even there. Cherry - The website suggests a red tint on the lips, but the redness is pretty much nonexistent once on the lips no matter how much you put on. I got this flavor for a light tint. This one has that artificial cherry scent like that of red lollipops you would get from fellow classmates on Valentine's Day in 2nd grade. If you like cherry, this one is for you. These come in a small squeezable tube with a twist of cap. I actually do like how moisturizing it is, however it's kind of pricey for a balm ($12) considering you can find many that do the job under $4. That said, I really like how long the moisture lasts and love the flavor options. The formula provides a quicker moisturization than my drugstore Chap Stick. The time it takes for the oil to melt over your skin is shorter. 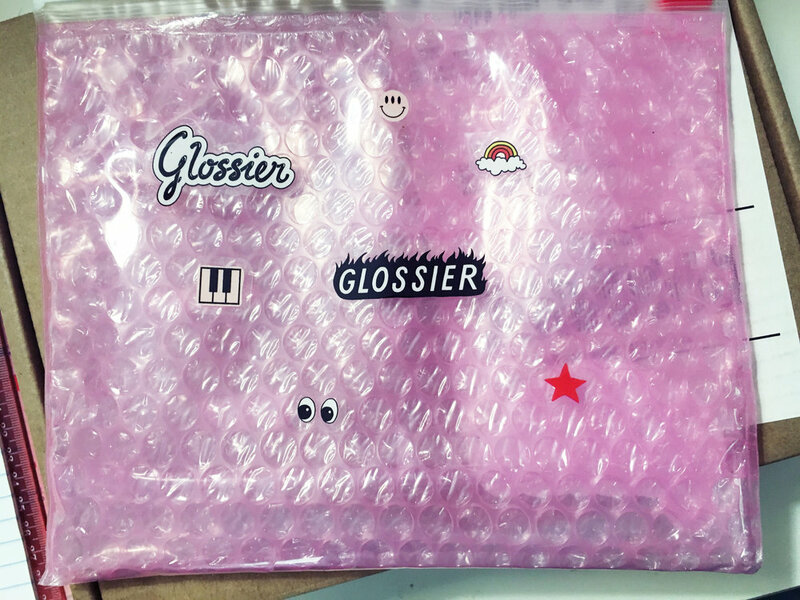 Glossier balm dotcom back packaging label. Click for larger image. Also, I've had this balm for about six months now, so I've also grown attached to it and use it as my go-to balm. I use lip balm daily, and I tend to reach for this one. Once I'm finished with these tubes, I'll likely repurchase an try the mint and rose flavors. 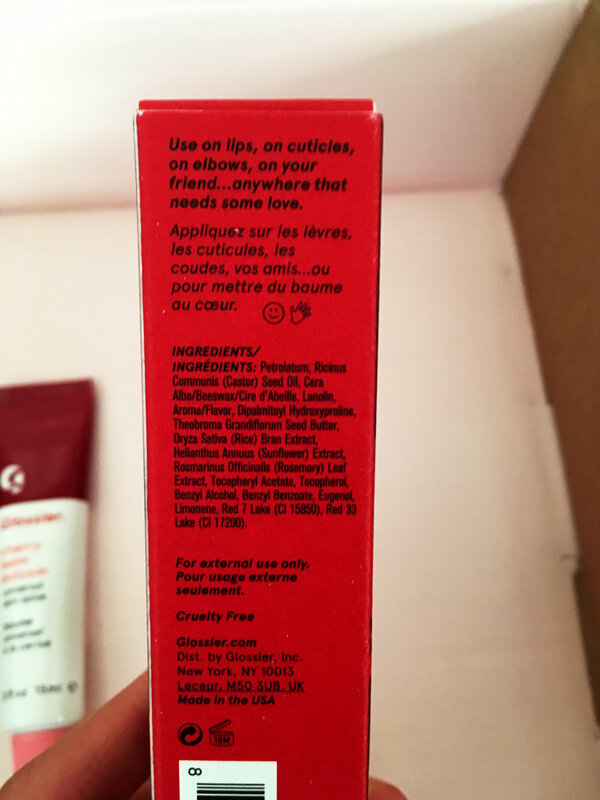 Cherry balm dotcom back of box. Upon receiving the package, I was pleasantly surprised by the care Glossier puts into their packaging. 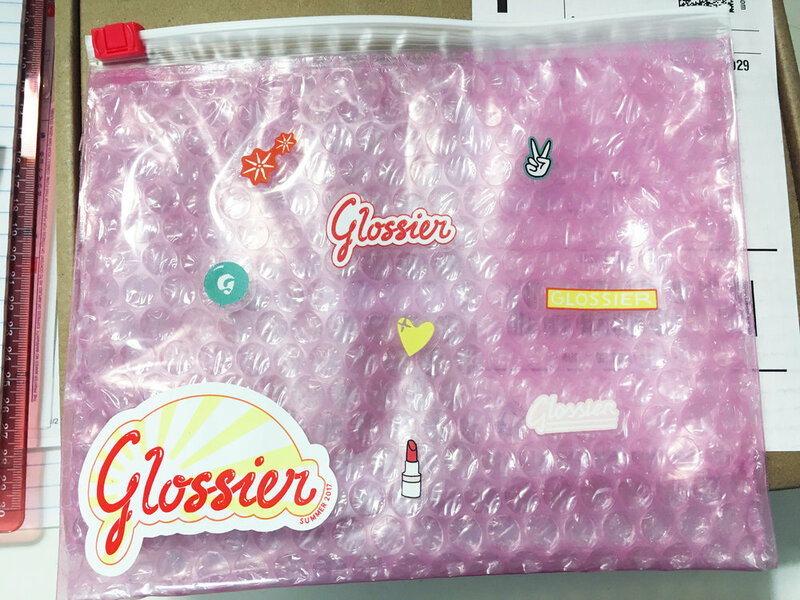 You also get a clear, bubble-wrap type of ziplock bag, which is useful for travel, and a sheet of cute stickers to customize your new Glossier product and freebee bag. The kid in me immediately stuck stickers every where - laptop, planner, face! I've collected few of these now that I'm addicted to Glossier, and I forsee that I'll continue to collet a few more in the future.